Heineken UK is the best performing sponsor of the upcoming Rugby World Cup, while New Zealand have been rated the “Most Social Rugby Union”, according to new research. 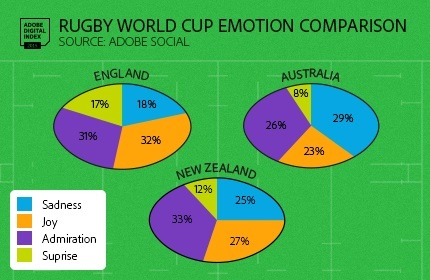 The study, from Adobe, looks at the teams and sponsors of the UK-hosted event, based on social mentions, sentiment, following and ranking within world rugby. Australia came in second and England a close third, the study found. •	Heineken UK is the best-performing Rugby World Cup sponsor in social, running a specific advertising campaign and engaging 29 percent of its Twitter following. •	Social mentions of the Rugby World Cup have grown by 116 percent since July. •	The Rugby World Cup launched a mobile app earlier this year to engage more with fans in the social space,. In terms of sponsors, Heineken UK is the best performing sponsor of the event when it comes to social. It’s running a specific advertising campaign around the event, and has 12,600 followers on its UK Twitter account and 3,600 mentions, an engagement rate of around 29 per cent of its following. This compares with fellow sponsor Toshiba, which hasn’t run an RWC-specific campaign and has only engaged two percent of its following around the event. “The England fan base receives an honorable mention for demonstrating the most positive vibe; 63 percent Joy and Admiration,” Simon Morris, Director Demand Marketing, Adobe Systems Europe said. ADI’s analysis of the tournament shows that if the Rugby World Cup were based on fan excitement, New Zealand would triumph in the final against Australia, with England beating Argentina to take third place. The Rugby World Cup itself has seen its social stature grow week on week, with social mentions up by 116 percent since ADI began its tracking on 4 July this year. But it still lags dramatically behind football’s World Cup, generating only about five percent of the buzz of last year’s FIFA World Cup. Sentiment analysis around the tournament shows 54 percent of the buzz reflecting Joy, Admiration, and Anticipation, with 27 percent Sadness resulting mainly from ticket availability and pricing around the event. Soundcloud is the favoured social platform around the Rugby World Cup, drawing 40,000 more followers than Twitter. “It seems that fans prefer to relive their favorite rugby moments though audio clips rather than talking about them in 140 characters or less,” Morris said. Rugby’s relative lack of social media presence is reflected in the social following of its top players, compared with athletes from other sports. Real Madrid and Portugal footballer Cristiano Ronaldo is the world’s most social athlete, with 142 million followers across Twitter and Facebook. 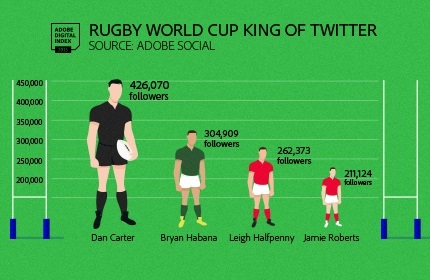 By comparison, All Black Dan Carter--Rugby’s “King of Twitter,” according to ADI--has just under 1 million followers, and six of the top 10 highest paid rugby players don’t have official Facebook pages. The Rugby World Cup is working to be more socially aware and to engage with fans in the social space. In July this year, it launched a mobile app, allowing fans to follow their teams through the tournament, purchase tickets, and share what each Union is saying on social media. So far, the RWC app has had more than 500,000 downloads. Digging into that number, ADI found that the iOS version ranks equal to or higher than the Android version in every one of the top 10 downloading countries except France. However, enthusiasm for the app is limited to mobile phones, with iPad rankings ranging from the low 200s to the high 900s. ADI used Adobe Social to analyse the social engagements (mentions, page likes, and followers) around the Rugby World Cup, based on more than 2M mentions, likes, shares, official page likes, and followers across blogs, Facebook, G+, Reddit, Twitter, Dailymotion, Flickr, Instagram, Tumblr, VK, Disqus, Foursquare, Metacafe, Wordpress, and YouTube. Social data is publicly available and based on an aggregate total.